A bright and sunny dawn welcomed all visitors with all sorts of exciting events taking place throughout Carnival Day. 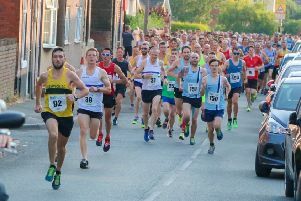 The four-mile road race attracts not only locals who fancy their chances, but experienced athletes from further afield who know they’re in for a bit of a test – and in front of cheering crowds. Lincoln’s Will Strangeway won it in a time close to the course record which stands at 20.17. 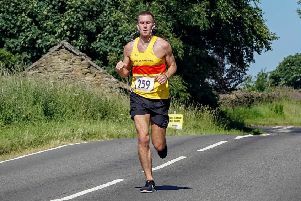 Strangeway’s time was 20.45, well ahead of the next runner home, local lad Tom Drabble, running for Stockport, in 21.12. First Buxton runner home was talented youngster Elliot Meylan, fifth overall, and first junior, in 22.58. Nicki Nealon, from Leicestershire, was first female, smashing the Over 50 record by an amazing four minutes, in 25.16. Buxton’s Amy Clark was second female in 26.18. Fellow club member Janet Taylor took the 1st Over 50 prize (Nealon taking the 1st prize, so the Over 50 slips to the next O50), and Kate Ledin took 1st Female Over 55 place. Clark, Taylor and Ledin comprised first female team winners for Buxton AC. For the men, Terry Fowler was first Male Vet 50 and Malcolm Firth first Male Vet 65. Buxton men also took the first male team – Elliot Meylan, Jake Fearn and Sol Clark.